A hacker with code name of 'Yama Tough' announce via Twitter that on Tuesday he will leak the full source code for Symantec Corp's flagship Norton Antivirus software which is 1,7Gb src. 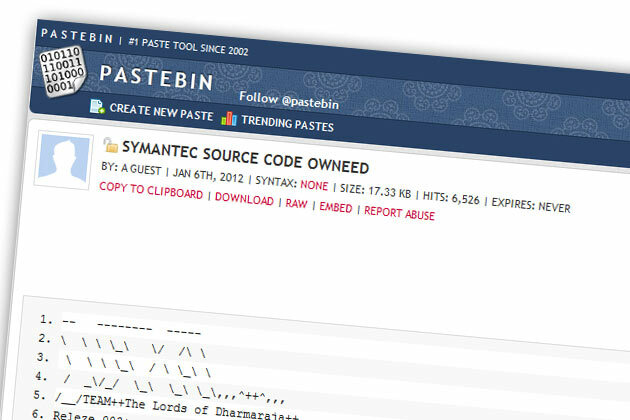 Last week Yama Tough has released fragments of source code from Symantec products along with a cache of emails. The hacker says all the data was taken from Indian government servers. Yama Tough is trying to prove that Indian government was snooping on America and China. YamaTough said via Twitter "Pass it on to forensics and win the lawsuit,".He has offered support to an American man who filed a lawsuit against Symantec Corp by publishing source code from a 2006 version of Norton Utilities, a software program at the heart of the legal dispute. It was not immediately clear how the source code might help the case. "We are still gathering information on the details and are not in a position to provide specifics on the third party involved. Presently, we have no indication that the code disclosure impacts the functionality or security of Symantec’s solutions. Furthermore, there are no indications that customer information has been impacted or exposed at this time." Symantec has confirmed that hackers have managed to steal a portion of Norton Antivirus’ source code, used in two discontinued enterprise products. According to Symantec, the company’s servers weren’t hacked, but the hackers managed to get the code from a third-party server.